After four days of meetings in Puerto Rico, the chairman of the House Committee on Natural Resources decided yesterday that the first issue to be thoroughly examined in a public hearing will be PROMESA. Democrat Raúl Grijalva (Arizona), chairman of the Committee on Natural Resources, announced that, as early as April, he will call a public hearing to request information and, in turn, understand what his colleagues think about changes, adjustments (and) solutions “that we think are necessary." Grijalva has been consistent in the fact that he wants to review how PROMESA is working, to review its powers over the government of Puerto Rico and to try to address the island´s "fiscal crisis" and public debt from a "humanitarian" perspective. 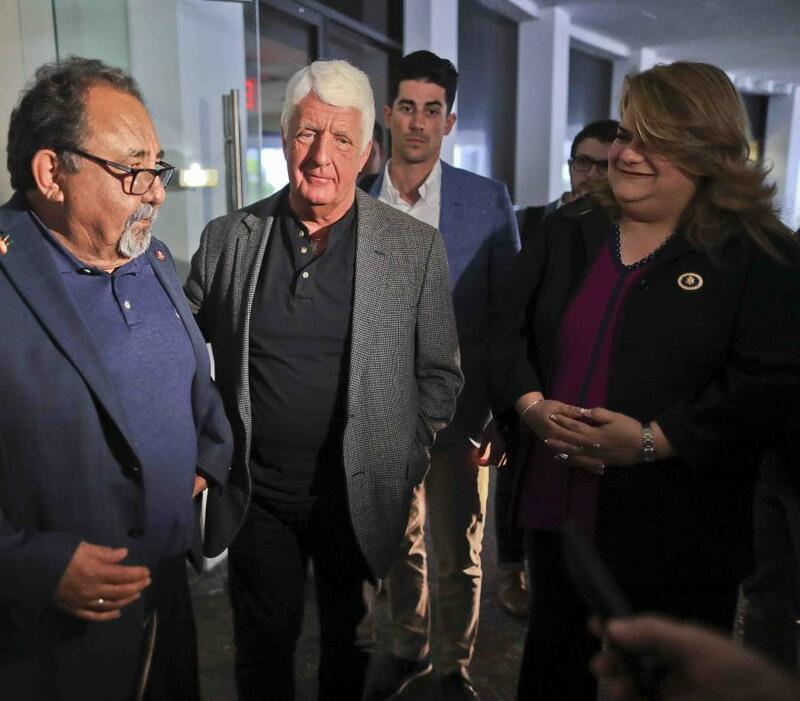 Democrat Grijalva made his comments after leaving a meeting with Natalie Jaresko, the executive director of the Board overseeing the island's finances and that was among the last activities of the congressional delegation in Puerto Rico. Jaresko said that during the meeting, that lasted an hour and a half, she had to answer questions about the budgetary and debt restructuring processes and the island´s economic development. Grijalva, Rob Bishop (Utah), Republican spokesman of the committee, and Democratic Representatives Rubén Gallego (Arizona) and Darren Soto (Florida), as well as Resident Commissioner in Washington, Jenniffer González attended the meeting with Jaresko. Although he said he was willing to review the law, Republican Bishop warned of the delicate bipartisan balance achieved to pass PROMESA, to the point that two thirds of the House and Senate voted in favor and added that any change is going to be problematic. After the meeting, Jaresko considered that the statute – product of a bipartisan quid pro quo that imposed fiscal control in exchange for debt restructuring – has worked. And she avoided theories about what reducing the power of the Board would mean, because she said that they did not have "a direct conversation on that matter." “I think the Promesa law is working. The fact that there is criticism is natural to the fact that we are achieving something. The creditors don’t like the Board because the board does its job in terms of debt restructuring. The government, the legislature and some citizens of Puerto Rico are not happy with the Board and I understand them, it is really complicated. It is not pleasant to have an entity that has the power the Board has. This is temporary,” said Jaresko. Grijalva has expressed special concern about the cuts to the University of Puerto Rico (UPR) and the Department of Education. According to Jaresko, the closure of about 300 schools arose as a proposal of the government of Ricardo Rosselló Nevares. Regarding austerity measures in the UPR, Jaresko said that these are "negotiated" initiatives between the government and the Board. "I do not think that PROMESA is not humanitarian," she added, noting that the fiscal plan -that drives increases in the cost of attending the UPR provides for scholarships to low-income students- does not close campuses, nor does it reduce the number of professors. Jaresko said the UPR has to diversify its sources of income and urged it to promote it among the US Hispanic community and in Latin America. Meanwhile, Commissioner Jenniffer González said that she asked Jaresko about the allegations made by former Revitalization Coordinator Noel Zamot, accusing the government of Rosselló Nevares of allegedly prevented the development of critical projects promoted by the Board and even to have shared information about potential investors with third parties. Jaresko said that she informed the members of the Committee that Zamot "was not making any accusation against any particular individual or any particular institution." "Noel was expressing his frustration," this is how Jaresko described Zamot's allegations made at an investors conference, which were revealed by El Nuevo Día last week. Commissioner González said that when Brian Modeste, Grijalva's advisor on Puerto Rican affairs, talked to Zamot about his allegations, the former Revitalization Coordinator did not provide names or confirm any cases of corruption. Jaresko stressed that both she and the members of th eBoard were satisfied with the engineer´s work, especially because Zamot established a systematized process to evaluate projects under PROMESA Title V.
The five members of the Natural Resources Committee began their last day in Puerto Rico holding a meeting with Governor Rosselló Nevares and with the team in charge of the island´s recovery and reconstruction. Among other things, during the meeting, Governor Rosselló Nevares insisted that the Natural Resources Committee addresses his government´s claim to advance in a process in favor of statehood. Grijalva reiterated that his committee´s priority is to review PROMESA and focus on the recovery of the island after Hurricane María. The decision to hold, perhaps in April, a first hearing on PROMESA confirms these priorities. But, Grijalva has dismissed a proposal for Puerto Rico to become a state, due the low voter turnout on the June 11, 2017 referendum, when 97 percent voted in favor of statehood, but it only a 23 percent turnout, after an opposition boycott. Meanwhile, Commissioner González did not agree with Grijalva regarding the issue that the political status debate could take years, as she still hopes that the Natural Resources Committee will deal with the matter "in two or three months", after she introduces her next pro-statehood bill. González said that if the main problem, that is precisely statehood, is not resolved, Puerto Ricans will not have equality in Medicaid, Medicare, the Nutrition Assistance Program, supplemental Social Security, in CTC (Child Tax Credit) and in other measures that represent total equality. Although he reaffirmed his support for the island´s statehood, Republican Bishop agreed with Grijalva that this is a subject that will require a lot of time. "Statehood is part of the solution," said Bishop, who during the last Congress, when he was the chairman of the Natural Resources Committee, never granted a hearing to the Commissioner's pro-statehood bill. Bishop added that it is a long effort and that it is “something we have to ensure that we do not fail, that we do not take steps backwards. It will not be easy. It will not be quick, but it has to be thoughtful,” he said. The congressional delegation ended its official visit to the island – peppered with controversies – with a visit to the Caño Martín Peña and a meeting with the National Guard directors. The trip may be remembered for the public listening session where they heard to 38 testimonies on Friday. The session was tinged with claims in favor of decolonization, the repeal of PROMESA and boos from statehood supporters against mayor of San Juan, Carmen Yulín Cruz, PPD representative Luis Vega Ramos and Representative Nydia Velázquez. González pro-statehood message, at the end of the event, caused a fight with Velázquez, who considered that the island´s representative before the House could violate the official trip norms. The Commissioner rejected Velázquez allegations, who on Saturday anticipated her return to New York. However, the controversy has now sparked a debate between the New Progressive (PNP) and Popular Democratic (PPD) parties. On one hand, the PNP accuses Velázquez of "a crude attempt to censor statehood supporters". On the other hand, the PPD urged to defend Velázquez from any attempt by the PNP to approve a resolution against her, by indicating that Commissioner González "contributed to the disorder" of the public session "supported by paid politicians."